The Ryder Cup fan who was struck by a wayward tee shot from America's Brooks Koepka has lost sight in her eye. The supporter was left with blood pouring from her face after the ball hit her near her eye socket on Friday. 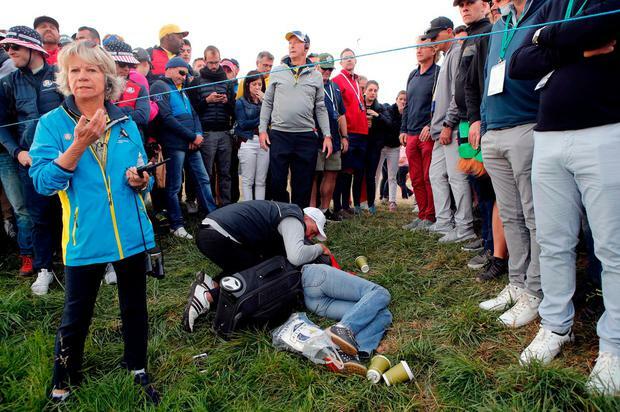 As medics rushed to the scene, Koepka dashed over to the crowd to check on the state of the stricken fan, and later handed her a signed glove as an apology. "It happened so fast, I didn't feel any pain when I was hit," Corine Remande, 49, told AFP. "I didn't feel like the ball had struck my eye and then I felt the blood start to pour. The scan on Friday confirmed a fracture of the right eye socket and an explosion of the eyeball." It has since been revealed that she has lost sight in the eye. "They told me I'd lost the sight in my right eye, and this was what was confirmed to me today." Remande confirmed she is taking legal advice. "Quite clearly, there is responsibility on the part of the organisers. Officials did not shout any warning as the player's ball went into the crowd. "I tried to stay positive with him so that he didn't lose his concentration. But once I was taken away, I didn't hear anything from the organisers." Kopeka, 28, missed a number of shots afterwards and was described as "shaken" after the incident on the short, par-four sixth hole after attempting to go from tee to green in one shot. Afterwards, the American, who won the US Open and US PGA this year, was wayward again with his tee shot off the seventh tee, narrowly missing more spectators lining the fairway. The European Tour has pledged "support for as long as necessary" to Remande.